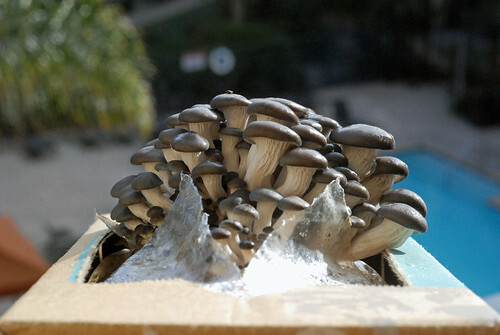 This entry was posted in Asides, On food waste and tagged Back to the Roots, coffee grounds, food, Grow Your Own Mushroom Garden, living green, mushrooms, products, reuse, reusing, sustainability, sustainable living by Jean-François. Bookmark the permalink. Neat post and I shared it out on Facebook. So you never got to eat your shrooms? So sad. That looks like a great thing to do with the kids; we’ve not grown them before. I’ll check them out! I’m currently reading the chapter on fungi (Teaming With Microbes) and am amazed at how they transfer nutrients from the tip (hyphae) to the body of the organism yards away. The term “conveyor belt” was used to describe their method. Well, one shroom – so not quite self sufficient yet, but one step closer. Very neat about the conveyor belt. Fungi are really amazing little things, and not just because some of them turn grape juice into wine. I was just reading about some very nifty ones that invade ants’ brains, make them march to cool moist spot, then make their heads explode in a shower of spores. We share a planet with exploding zombie ants; I mean, how cool is that? There’s an article about those fungi on National Geographic (http://goo.gl/JFFS4) if you’re interested, and how could anyone not be? I always tell the kids that even we are a part of the food chain, even if we can’t see our predators with our eyes. I am quite fascinated and even obsessed by our microscopic world — particularly in the soil. This is a great project–by turning waste into something useful, such as mushrooms, we are taking steps to saving the planet! Do you mind if we ask for your email, to interview you on food wastage? We would like to email you the questions. I’d be happy to answer any questions. I sent my e-mail address to your hotmail account. Good morning, Jean-François. I saw this post and immediately thought of you. I would like to try it! We are eating many mushrooms of late, and the kids are curious to grow their own. This looks like fun. Wow, very cool – definitely adding this to my list of planned projects. Hope you’ll be sharing the results of your efforts on your blog. There’s something about the bite and umami-ness of mushrooms that I find really satisfying, and that can often fill the void in meatless dishes. A thick slice of portobello pan fried in garlic butter often plays the role of a steak in our dinners. Grilled portabellos are a favorite! We ditch the butter, but use olive-oil and garlic as the flavor enhancer. Delicious!! You know, if we wind up growing our own ‘shrooms, I would not miss blogging about it. I love sharing learning experiences with others so they can feel confident about trying new things too.